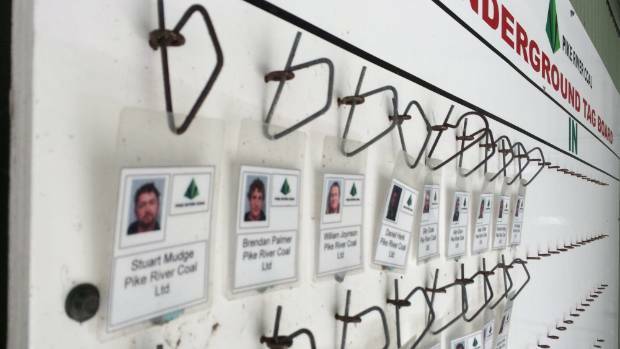 The tags of the 29 men killed in the Pike River mine disaster still sit on the tag board at the mine office. OPINION: I‘ve been scratching my head trying to recall the number of times someone in a position of responsibility in New Zealand fell on their sword in atonement for things that went badly wrong. Conservation Minister Denis Marshall did it after the Cave Creek viewing platform collapse in 1995 and Labour Minister Kate Wilkinson stepped down in 2012 over Pike River – in both cases, after commissions of inquiry released highly critical reports. Those two aside, I struggle to remember any minister, department head or company boss taking the rap for tragedies or adverse events that involved human failure. Accountability, the long-established principle that someone should be seen to take responsibility for serious mistakes, is frequently talked about but rarely practised. When an inquiry panel released its report last week into the Havelock North water contamination scandal that caused 5000 people to get sick and was implicated in three deaths, Hastings Mayor Lawrence Yule was quick to absolve himself of any fault. “I didn’t personally cause this contamination,” he said, and of course that’s true. But it’s not the point. Yule doesn’t seem to grasp that someone in charge has to carry the can, if only symbolically. People expect it. It’s the price that has to be paid for keeping the system honest. If no one ends up accepting personal responsibility and incurring a penalty, there’s little incentive to make sure it doesn’t happen again. That’s why, in the Westminster parliamentary system, ministers bear ultimate responsibility for their departments and are expected to resign if their subordinates fail seriously in their duty. This applies even though the minister may have had no idea that things were going pear-shaped. The rationale behind the principle is that it puts pressure on ministers to ensure everyone’s doing their job properly. That creates a culture of rigour and discipline that filters down through the system and keeps everyone on their toes. At least that’s the theory, and the same principle applies in local government – which is why a lot of people in Havelock North, including the man interviewed on television who spent weeks in hospital and lost 11kg as a result of bacterial infection, expected heads to roll following the e-coli outbreak. Faint hope, I’m afraid. For Yule, the timing was unfortunate. My impression is that he has been a very good mayor, which is why voters have repeatedly returned him to office since he was first elected in 2001. But his attempt to distance himself from responsibility for the water contamination is unlikely to win him votes when he stands for National in the Tukituki electorate later this year. To be fair, he’s not the only high-profile figure anxious to absolve himself of blame for things that have gone wrong on his watch. Former Ministry of Transport head Martin Matthews must be squirming as the media reveal acutely embarrassing details of the audacious $725,000 fraud perpetrated by his ex-employee Joanne Harrison. Judging by what’s been reported, there were multiple signs that Harrison was ripping off the ministry. Short of wearing a flashing neon sign saying “I am a crook”, she could hardly have been more brazen. Yet far from having his career prospects damaged by the scandal, Matthews was rewarded with a promotion to the position of auditor-general – a job in which he’s required to make sure no one misuses taxpayers’ money. The irony is exquisite. Please, no one tell John Oliver, the irritatingly smug US-based TV host who loves nothing more than poking fun at quaint little New Zealand. It’s not only in the public sector that bosses manage to evade responsibility for shocking failures. No one took the blame or paid a penalty for the tragic collapse of the CTV building in the 2011 Canterbury earthquake, despite damning evidence of professional dereliction. Ditto the 2010 disaster at Pike River, where the families of the 29 dead miners still cry out for justice. Again there was clear evidence of multiple failures at multiple levels, but only token penalties were imposed. Why does it seem so hard to establish culpability for catastrophic mistakes? One possible explanation is that as bureaucracies grow bigger and more amorphous, lines of accountability become blurred and blame becomes harder to sheet home. Management structures sometimes seem designed to protect and insulate people. Responsibility gets diffused and the smoking gun, if there is one, is buried so deep that official inquiries never seem able to find it. And in the meantime, public confidence in “the system” continues to be steadily eroded.